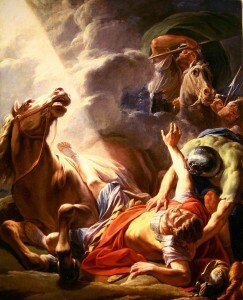 Today is the Festival of the Conversion of St. Paul on our liturgical calendar. This festival has been on every Liturgical calendar in every English hymnal of the LC-MS. In spite of this, I don’t remember any congregation making a fuss about it in my childhood. St. Paul’s life-changing experience on the road to Damascus is related three times in the Book of Acts (9:1-9; 22:6-11; 26:12-18). As an archenemy of Christians, Saul of Tarsus set out for Damascus to arrest and bring believers to Jerusalem for trial. While on the way, he saw a blinding light and heard the words: “Saul, Saul, why are you persecuting Me?” Saul asked, “Who are You, Lord?” The reply came, “I am Jesus, whom you are persecuting.” In Damascus, where Saul was brought after being blinded, a disciple named Ananias was directed by the Lord in a vision to go to Saul to restore his sight: “Go, for he is a chosen instrument of Mine to carry My name before the Gentiles and kings and the children of Israel” (Acts 9:15). After receiving his sight, Saul was baptized and went on to become known as Paul, the great apostle. So Saul, the persecutor of Christians, became Paul, the “fool for Christ” (1 Corinthians 11:16-17). He who had set out to destroy the Church spent his life building and extending it. For those who like historical details, the day seems to have first been celebrated in “Gaul” (France), but didn’t really start spreading until the 12th century. It never did catch on in Eastern “Orthodox” churches. Prayer: O God, by the preaching of your apostle Paul, you have caused the light of the Gospel to shine throughout the world; Grant, we pray, that we, having his wonderful conversion in remembrance, may show ourselves thankful to you by following his holy teaching; through Jesus Christ our Lord, who lives and reigns with you and the Holy Spirit, one God, now and forever. Amen.